You may remember dancers from the La Scala Ballet Company objecting at the decision to appoint Mauro Bigonzetti as it’s new boss and to his programming for his first season? 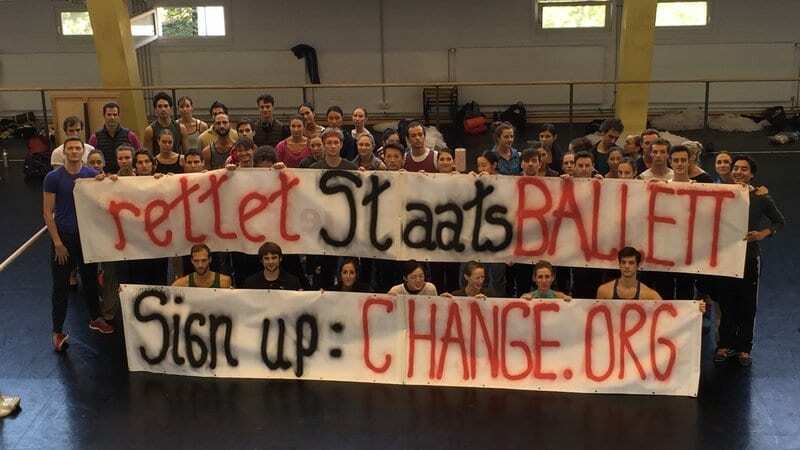 Now dancers at Berlin have initiated a ‘Save Staatsballett Berlin!’ campaign. Although Bigonzetti was confirmed as the new director, the Berlin troupe are hoping to be successful with their Change.org petition against the appointment of Sasha Waltz and Johnannes Öhman as co-directors of the Staatsballett from the 2019-2020 season. With the announcement to far in advance it gives them time to get organised, while the dancers at La Scala found they they had a new director just a few weeks after Makhar Vaziev suddenly interrupted his contract in Milan to join the Bolshoi. The Staatsballett Berlin is currently Germany’s largest and Berlin’s only classically trained ballet company. Together with its preceding institutions it has a classical tradition of more than a hundred years. Therefore we, the dancers of the Staatsballett Berlin, reject the appointment of Sasha Waltz and Johnannes Öhman. Unfortunately the appointment has to be compared to an appointment of a tennis trainer as a football coach or an art museum director as an orchestral director. This decision by Michael Müller [the Mayor of Berlin] and Tim Renner [a record producer and currently the city’s Secretary for Cultural Affairs] demonstrates their complete ignorance of the traditions and lines of development of dance and ballet in particular. Also special mention must be made that such an appointment to be announced publicly three years in advance is not only unheard of in the world of dance but also disruptive and insulting to the company. That this announcement comes in the middle of an election campaign leads us to believe that it is politically motivated rather than artistically, again showing a profound lack of respect for our company, our traditions, our art form, and our audience. While saying that they ‘respect the work of Sacha Waltz’ they add that they ‘find her completely unsuitable’ to lead the company. Sasha Waltz is a choreographer of dance theatre. This form of stage dance needs other artistic qualities than those which a classically-educated ballet dancer has developed and is dedicated to. Which is exactly the same argument made by the dancers at La Scala. Considering these facts, we ask the Governing Mayor and Senator for Culture, Michael Müller, and his Secretary Tim Renner to recall this decision immediately. We strongly suggest the Stiftungsrat of the Stiftung Oper in Berlin to not ratify these decisions under any circumstances. A selection committee should to be set up which finds a single ballet director for the Staatsballett Berlin for the succession of Nacho Duato after the 2018/19 season. We, the dancers of the Staatsballett Berlin, call the politicians of the Abgeordnetenhaus of all parties, our ballet colleagues from all over the world, and most importantly our loyal audience to support us in this petition! La Scala Ballet School's director for 32 years on "Teaching Dance"